Passwords on Post-it notes…oh no! I have been to multiple customer sites recently working in various non-profit organisations. 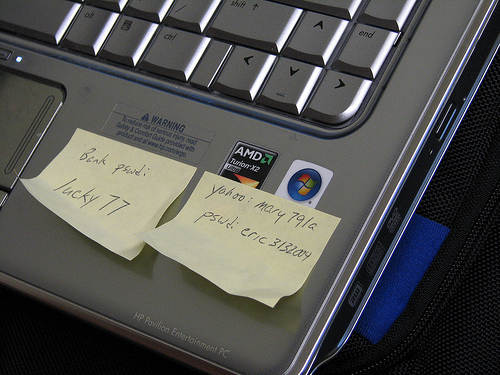 Time and time again, I have seen Post-it notes affixed to desktops or laptops with user names and passwords. I saw a list of user names and passwords on a spreadsheet while seated at one person’s desk. Another person sat in a meeting with a series of passwords affixed to the top of her laptop facing four of us on the opposite side of the table. Never use the word Password as your password. You’d be surprised at how many people use this as an old standby! Once you come up with a convention you will remember, keep it to yourself. Use your wall space for photos of your favourite fundraising consultant!